Comments: This particular reading for a logogram which represents an always left-turning headless body was suggested by Yuriy Polyukhovich in a conversation with the junior author in 2003. 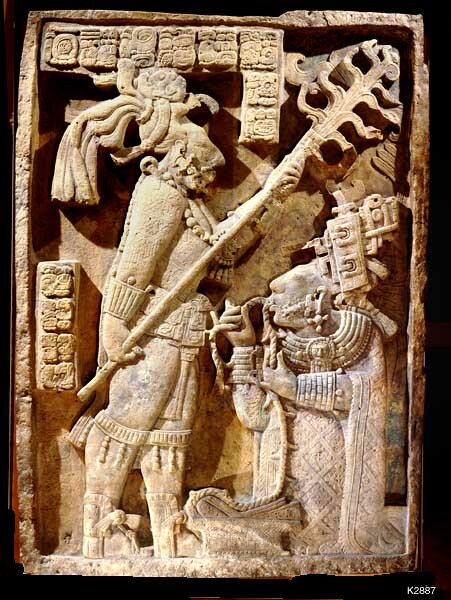 The reading is based on a k'e- phonoetic complement on Tamarindito Hieroglyphic Stairway 2 (A2-B2) and twice a phonetic complementation -b'a on Yaxchilan Stela 20 (A5) and on the Middle Tablet of the Temple of the Inscriptions Palenque (H9). This logogram is different from the left-turning body with a head which occurs in the codices apparently with the reading EM' 'to descend' and another similar but headless glyph for which David Stuart suggested a PAT 'back' reading and occurs in the bench inscriptions of Palenque Temple XIX.